This year’s theme for International Women’s Day is “The Gender Agenda: Gaining Momentum.” Global organizers provide this overview for the celebration’s focus: Over time and distance, the equal rights of women have progressed. We celebrate the achievements of women while remaining vigilant and tenacious for further sustainable change. There is global momentum for championing women's equality. When it comes to women’s equitable political representation, the United States needs greater momentum to catch up to most of the world. Today, the United States ranks 77th in the world for women’s parliamentary representation. Accounting for ties, 91 countries actually top the U.S. in the proportion of women in national legislative posts. And, the pace of change in women’s congressional representation in the U.S. over the past decade has been slower than the increases in women’s global parliamentary presence. Some argue that advancing gender equality at all levels will pave the way to women’s leadership at the highest echelons of power, including head of state. But, of course, the momentum for change can come from the top down: many hope that female heads of state will both champion and inspire women’s equality. Most likely, the possibilities for advancement move in both directions. Seventeen women serve as heads of state in 2013. Sixty-nine women (from 46 countries) have acted as their country’s presidents or prime ministers, and almost half of those women took office in the past decade. Unfortunately, we cannot count the United States among them. While it is too simplistic to assume female heads of state will fix gender inequity in their respective countries, one need only watch Australian Prime Minister Gillard’s recent floor speech on sexism and misogyny to see the benefit of a woman’s voice taken seriously in governmental debates – not only on policy issues, but on institutional norms and processes. As we celebrate the “global momentum for championing women’s equality” today, we should consider how to encourage greater momentum toward women’s political equality at home and abroad. For the United States, that means rejecting complacency about our unimpressive rankings for women’s political leadership and looking to our friends throughout the globe for inspiration on how (and why) to increase women’s political representation at all levels of government. For CAWP's ideas on how to celebrate International Women's Day, click here. On the one hand, [African American women] are gaining increased access to political offices, now outpacing African American men in winning elections. On the other hand, they continue to face considerable obstacles to securing high-profile offices at both the state and national level. 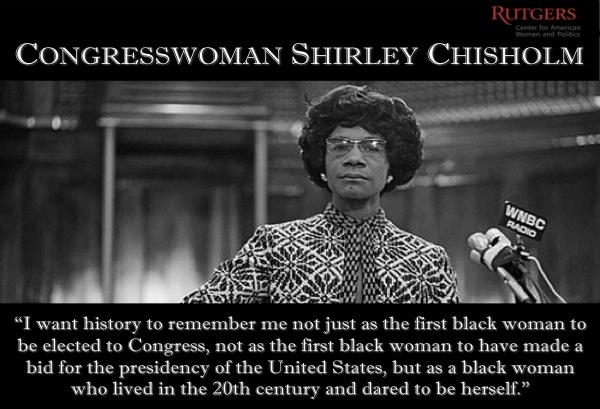 In this African American history month – and every day of the year - we honor the daring women who follow in Chisholm’s footsteps, and we should all encourage more women to do the same. Smooth, Wendy. 2010. “African American Women and Electoral Politics.” In Gender and Elections: Shaping the Future of American Politics, eds. Susan J. Carroll and Richard L. Fox. New York, NY: Cambridge University Press, 165-186. Today, we watch as Barack Obama is sworn into his second term as President of the United States. Four years ago, Obama made history as the first African American to win a major party nomination for the presidency and, ultimately, take the oath of office. But President Obama wasn’t the only candidate to make history in 2008. Hillary Clinton won more votes (18,000) and more delegates (1010) than any unsuccessful presidential primary candidate in history. She made history as only the second woman to have her name formally placed into nomination for president at the Democratic National Convention, and left the campaign amidst speculation that she would run again in 2012 or 2016. That speculation has hardly died down and, despite Clinton’s own claims that her candidacy is unlikely, the most recent polls show Clinton as the most popular contender for the 2016 contest. As we celebrate the history being made today on the steps of the U.S. Capitol, it is worth taking a moment to reflect on the women who have blazed a path toward the White House and the potential for a woman to take the oath of office in years to come. Two women became candidates for the presidency in the nineteenth century before they could even cast ballots themselves. Victoria Woodhull in 1872 and Belva Lockwood in 1884 were both nominated as presidential candidates by a group of reformers identifying themselves as the Equal Rights Party. As the first woman to practice law in front of the U.S. Supreme Court, Lockwood knew what it felt like to stand alone and did so again in her second presidential bid in 1888. It wasn’t until 1964, 76 years after Lockwood’s second bid, that Republican Senator Margaret Chase Smith from Maine became the first female candidate to have her name placed in nomination for president at a major party convention, winning twenty-seven delegate votes from three states. Eight years later, in 1972, Congresswoman Shirley Chisholm of New York, the first African American woman elected to Congress, became the first woman and the first African American to have her name placed in nomination for the presidency at a Democratic National Convention, winning 151.95 delegate votes. They made a claim on public awareness by attaching voices and living images of accomplished woman leaders to the idea that one day a woman could conceivably be president. Their actions made the idea less outrageous to conceive. You can be so proud, from now on, it will be unremarkable for a woman to win primary state victories, unremarkable to have a woman in a close race to be our nominee, unremarkable to think that a woman can be the president of the United States. And that is truly remarkable. Speculation has already begun about who will run, and who can win, the presidency in 2016. Some women, most notably Hillary Clinton, are among the names being floated as serious contenders. Still, the presidency remains arguably the most masculine office in the land – presenting obstacles well-understood by the women who have run. As she fought to allow women to argue in front of the U.S. Supreme Court over a century ago, Belva Lockwood said, “The glory of each generation is to make its own precedents.” While women have (slowly) worked to establish a precedent of women running for major party presidential nominations, our generation has yet to set a precedent of a female commander-in-chief. So as we celebrate the political history made today, let us consider the political history women have left to make. 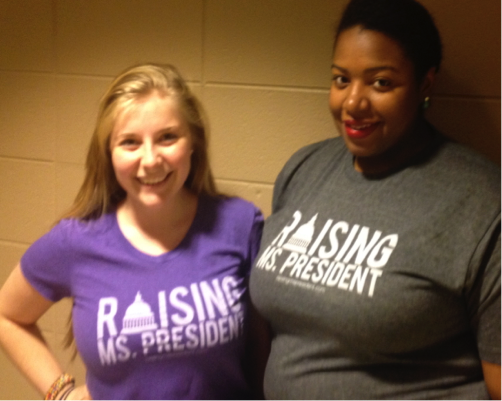 Read more about Madam President?